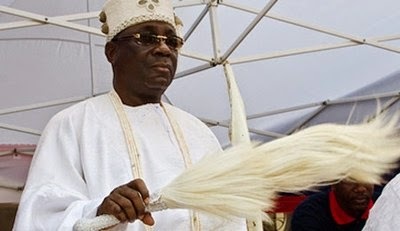 The Oba of Lagos, Riliwanu Akiolu, says there is a need for non-indigenes in Lagos State to respect the tradition and culture of their host. While responding to a question on the threat he issued out to Igbo residents in Lagos State if they did not vote for Akinwunmi Ambode of the All Progressives Congress, Akiolu maintained that he had no ill feeling towards Igbo in the state as some of his closest friends were Igbo. He said, “Eze Odimegwu, who is a former CEO of Nigerian Breweries, is still my best friend as well as many others. The Obi of Onitsha came to visit me here a few days ago. When you go to a place, you have to respect the host leaders, particularly the traditional leaders there because you are coming to benefit from their success. He said the video which showed him issuing threats to Igbo leaders was a misrepresentation of what truly transpired. He said the issue was twisted by those who wanted to gain political advantage ahead of the governorship election but God put them to shame. “Those who orchestrated the entire incident know themselves and I tell you, those (Igbo leaders) who came here on that day understand me a lot and have even been coming since then,” he said. Akiolu said many of the non-indigenes were deceived by politicians in their quest for power. He said, “The man that promised to hand them deputy governorship slot and four commissioner positions and would elevate the status of Eze Ndigbo to that of Oba of Lagos has since denied it. He urged all Igbo who won elections in Lagos State not to disappoint the people. The monarch said he was confident that Ambode would do well in office. He said Ambode would serve as governor for eight years not just because it was the will of God but because he would perform excellently well. He, however, said Agbaje was free to contest again in 2019 if he wanted. He said he had nothing against the Peoples Democratic Party or its governorship candidate, Mr. Jimi Agbaje, but noted that all humans are equal in the eyes of God but are not equal in the love of God. He said Ambode proved his competence by saving the state from financial hardship when it was deprived of funds from the Federal Government. Akiolu said he was not a politician but was only interested in the prosperity of Lagos and would continue to support the best.